The subtitle of Nokia’s blog post was ”From hype to niche technology”. What is your opinion? Will we see wireless hype again? 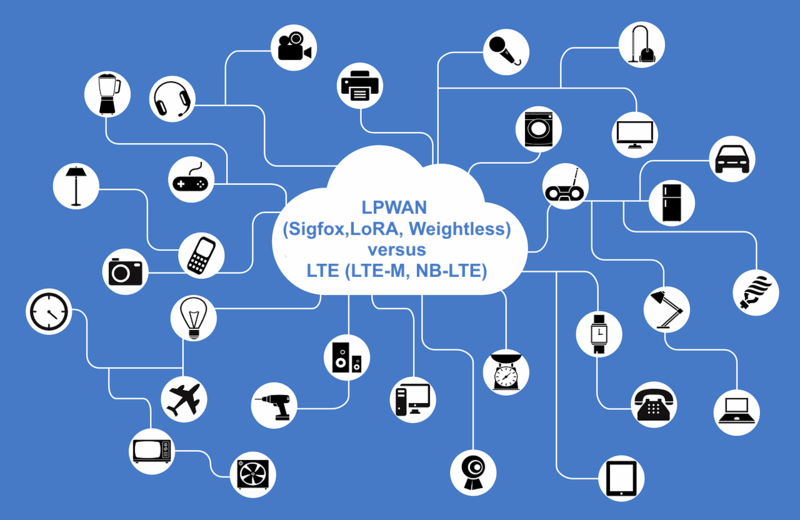 Sigfox and LoRa are LPWAN (Low Power WAN) technologies. Sigfox and LoRa are in fact not the only LPWAN technologies. For some reason the Nokia article Nokia did not mention Weightless. And for 6LowPAN we have different 6LoWPAN protocol stacks, in Germany I am aware of at least three. And these three stacks cannot communicate with each other. Is LoRa born to be niche? However, perhaps LoRa is ready to be a niche solution. If we would like for example to cover the manufacturing plants of Volkswagen in all continents, then I have a solution ready to ship. have been able to get my hands on LoRa base stations and LoRa modules from one supplier. The base station and the modules can run in the 868 or 915 MHz band.We will not have any trouble with thse frequency bands. Are LTE-M and NB-LTE the solutions? In the Nokia network blog they mention LTE-M and NB-LTE. LTE-M and NB-LTE are great technologies and will compete with LoPWAN. 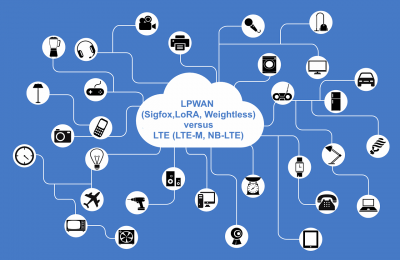 LTE-M, NB-LTE and LPWAN address the same market segment in IoT. Both LTE technologies will offer worldwide roaming. For Sigfox and LoRa, roaming is not supported. Nevertheless LTE-M and NB-LTE may be the wrong technologies to cover the manufacturing plants of Volkswagen all over the world. Be aware LTE <> LTE. We already have 43 LTE bands on our nice green planet. With my LoRa proposal above you will use the 868 or 915 MHz band only and you can place your order now. For LTE-M and NB-LTE you have to wait. Even if I ship you samples of LTE-M or NB-LTE modules tomorrow then you will not be able to use them, because the LTE-M or NB-LTE networks are not yet built out. What will businessmen do? Will they wait for LTE-M and NB-LTE or will they take an off-the shelf and ready-to-use LoRa base station plus LoRa modules and ship in time to satisfy the manufacturing plant project? What is your opinion? Will we get wireless hype again? Will you use LoRa or Sigfox to win business now? Who will win this IoT race and will have the most small battery-driven wireless IoT devices in their network? If you are interested in evaluating samples of LoRa, Sigfox, Weightless, LTE-M or NB-LTE modules, then do not hesitate to drop an email to harald.naumann (at) gsm-modem.de . I will stay tuned and I will keep you posted on these new wireless IoT technologies. Thanks for sharing for you opinion. I am studying the comparison of LoRa and Sigfox, and from other articles, they looks have almost the same features, and it should target the same market. Could you tell which market should implement LoRa better that Sigfox? Pearl, Sigfox and LoRa are addressing the same market. However, there are differences. LoRa you get on LoRaWAN and on properitary protocols. Moreever, for LoRa I can help with a base station and modules from one hand. You can place an order with me, set up your own LoRa single cell network and get experience. In parallel to Sigfox and LoRa there is Weightless. At Weightless you can set up your on single cell network easy as well. Are you aware of the number and type of certifications you will need and their costs in your target terrtitories? The questions are related to cellular modules. For LPWAN modules the questions are legal as well. Thanks for your technical explanation. About the Sigfox and LoRa, those solution are suitable the infrastructure between devices-B/Ss or devices-IoT gateway-B/Ss. Sigfox does not offer roaming as it actually doesnt exist. When you register a device on the network, it wilk work everywhere the same if you HW allows it. Anthony, I am living in Germamy and as soon I move to Austria there is no roaming, because there is no Sigfox network. A GPS locating system like a dog tracker close to Austria makes no sense, because worsr case the dog will pass the border.